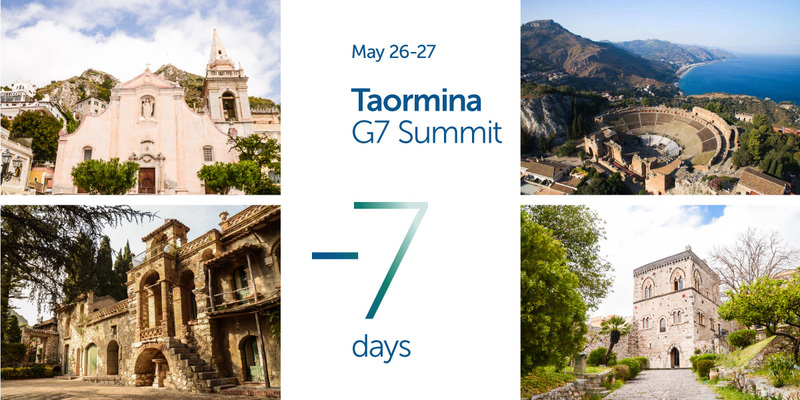 On May 26-27, Taormina will host the G7 Summit. The Sicilian town was chosen to launch a message of welcome and of openness. Sicily represents a bridge between Europe and Africa, and Taormina -- with its history rooted in antiquity -- is the crossroads of several civilizations. The Summit will be divided into two days of work, with the participation of 12 Heads of State and of Government. In addition to the leaders of the G7 countries (Italy, Canada, France, Germany, Japan, the United Kingdom and the United States) attendees will include the President of the European Commission and the President of the Council of the European Union. During the second day, all these leaders will be joined by 5 Heads of State and of Government from African countries, as well as 6 international and African organizations. The total number of delegates at the Summit will reach approximately 2,000. Members of the Italian and foreign press present will also be numerous: over 2,000 accredited journalists will be working in a dedicated open space with 1,200 workstations. TVs will have a special area, with 70 TV boxes and 61 open space TV areas. Mobility will be guaranteed by a fleet of 150 cars, as well as numerous electric vehicles. The Summit will take place in different locations around Taormina, creating the opportunity for the town to showcase its historical and architectural beauties, from the Greek Theater to the Public Gardens, from the Duomo to the "Isola Bella" island.